April 2018 - Don Mills Builder, Inc. April 2018 - Don Mills Builder, Inc.
Are you trying to decide whether to buy or build your next home? Debating the pros and cons of getting a custom home versus purchasing one that is already complete? Consider the benefits of building a custom home in Greensboro with the elite team at Don Mills Builders. Here are just a few of the many reasons for you to follow your dream of building a custom home. You get what you actually want. This is probably the most obvious reason to build your next home, but it is also the most important. By building your own home, you get ‘behind the wheel,’ so to speak, and make the executive calls on design features and amenities. No other home will be exactly like yours so it is truly unique to you. You can create value within your home. Often, there are little additions you can build into a custom home that you would not be able to do with an existing property. This will allow you to increase its inherent value. This will be very useful to you as a homeowner should you choose to move or sell the property in the future. The value of real estate is increasing. The big recession in 2009 caused a major economic downturn that lasted several years. However, one of the benefits of the recession was that once the real estate market recovered, homes were due for a big boost economically. A great reason to move forward with building your custom home now is the fact you will almost definitely see an increase on the value of your property in the near future. Ownership is on the decline in the U.S. At this point in time, we are seeing an unfortunate trend and phenomenon where home ownership and general ownership are on a steep decline. More and more families are opting to rent versus purchasing a home, which puts the renter at a substantial disadvantage and provides some level of insecurity regarding how they will be able to build equity in the future. Greater Energy Standards. Energy efficiency and saving technologies have increased greatly from year to year over the last decade. Therefore, homes built even just three or four years ago will not have the same quality of energy saving efficiency that a new home will have. By building a custom home in Greensboro with Don Mills Builders, prospective homeowners can ensure they are including features which will lead to greater savings down the road, as well as make the house a great investment. Don Mills Builders provides numerous locations and floorplans for those wishing to build a custom home in Greensboro and the surrounding area. Don Mills Builders has decades of experience in the industry and is known for providing quality craftmanship with the most desired features and designs. The results are amazing homes in which a family can create a lifetime of memories. The team at Don Mills will ensure the home is designed to meet your particular needs and be one you will be proud of for years to come. Some homeowners know exactly where they stand when it comes to this choice. But if you’ve ever found it difficult to decide between buying a brand new home vs. an older home, here are some things to consider that will help you make an informed decision. 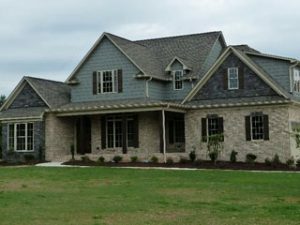 When looking for homes for sale in Summerfield, NC you’ll find many different homes built in various decades, newly built homes, and even ready home sites for custom building. Let’s explore the differences. There’s something exciting about being the first people to live in a home. Everything is so clean and shiny. You have a fresh canvas to decorate as you please. New homes are equipped with the latest technology when it comes to everything from smart home systems to energy efficient design and appliances. Plumbing, electrical wiring, insulation, foundation, structure—all are up to current codes. Newer homes also tend to be bigger, as size is a big factor for today’s homebuyers. At the same time, new homes tend to have smaller, less mature lots; though this is not always true, depending on the neighborhood and builder you choose. New homes may have a few kinks that need to be worked out since no one has lived in the home yet. However, most new homes come with a one-year warranty that covers anything that isn’t performing up to standard. A new home may also settle in the first few years after it’s built, requiring repairs of cracks in walls and doorways or worse, foundation repair. New homes are sometimes priced higher than older homes. An older home has stood the test of time. You can tell that its structure and foundation are good quality, which can be proven through a home inspection that is a necessary part of any home purchase. Classic homes have the architecture and style of the time period in which they were built, which gives them character. Bigger lots with mature trees and landscaping offer beauty and privacy. Older homes in established neighborhoods are less likely to experience changes. You may also save some money by purchasing an older home. The old home charm can sometimes be overshadowed by problems that can accompany older homes. Plumbing and electrical wiring may be old, meaning problems like water pressure, leaky old pipes, and lack of electrical outlets and voltage to support today’s technological needs. Avoid these issues by looking for an older home that boasts “recently updated” features. You’ll likely find less storage and smaller closets in an older home. And they also tend to have less overall square footage and smaller rooms. In highly desired areas like Summerfield and northern Guilford County, new homes and home sites are currently available. Take advantage of the benefits of brand new homes for sale in Summerfield, NC. Recently completed Don Mills homes and new home sites are available now in up and coming neighborhoods. Call (336)362-1777.